As a data quality leader, your first obstacle is likely to be the data quality business case. You may have the data quality vision, belief and expertise, but if you can’t secure funding, your aspirations are a wistful fantasy. 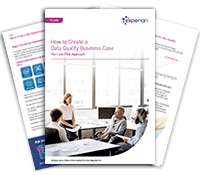 how to deliver a virtually zero cost data quality pilot. how to demonstrate the value of further data quality management investment. how to create a long-term capability for data quality management.